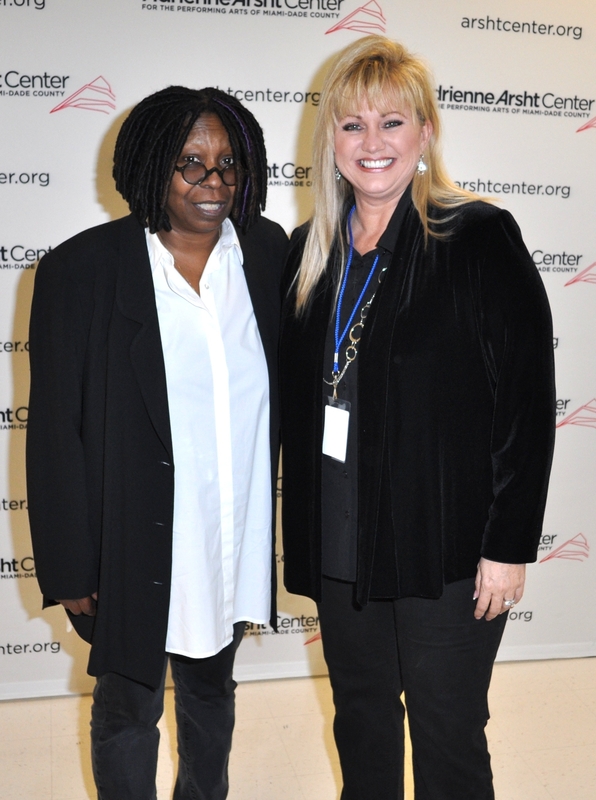 MY POV: SUSAN WISE FROM 101.5 LITE FM HOSTS Q&A WITH WHOOPI GOLDBERG…AND TELLS US ALL ABOUT IT! From time to time, I get the opportunity to welcome local celebrities on stage or at an event, but every now and then a biggie comes along. A few weeks ago my promotions staff told me I might get to do something with Whoopi Goldberg on stage at the Adrienne Arsht Center in Miami! The day comes. I’m waiting at the back stage entrance. I call my contact person and she and another woman greet me, then I’m given my credentials. I’m thinking, OK cool. I get to wear a back stage pass. Then I’m walking down the hall and there she is in all her Whoopiness, posing for pictures! The two women push me up front and center and said, “Whoopi, this is Susan Wise. She will be your moderator for the Q & A part of the show.” Moderator…what does that mean? She shakes my clammy hand and we turn for a picture. Then I get whisked away to my dressing room. Dressing room? I came already dressed…Why do I need a dressing room. That’s for big stars, I’m just a DJ. And there it is: a big beautiful golden door with my name shining brightly on the front. SUSAN WISE. (Okay it was a normal door and my name was scribbled on a piece of paper and taped on the door, but so was Whoopi’s, and she was right next door….how about that?!) I’m next door to the famous Whoopi Goldberg! Afterwards, I watched the show from my dressing room and then 50 minutes into the performance, the stage director comes to my dressing room. “Susan …it’s time.” Oh lord, it’s time…time to faint. My hands are shaking; that hasn’t happened in years. I walk to the backstage area where I can see Whoopi doing her thing in front of a full house. My dad and Howard are out there somewhere. God, I hope I don’t trip. What if I freeze? Naw…I’m a DJ…I can do this! Whoopi calls me on stage. I walk out and introduce myself and perch on a stool center stage next to our star. I inform the audience of what we are going to do with the Q & A. Then, I spent the next 37 minutes guiding Whoopi Goldberg—who is answering questions, being funny, clever, political and sometimes naughty—from the best seat in the house. What a fabulous night!